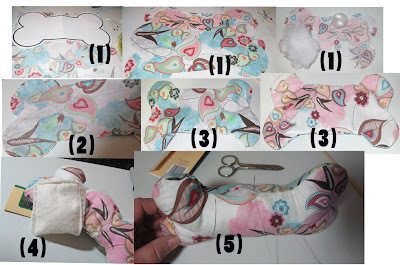 My first craft project for 2011 turned out to be a Dog Bone. My dogs love to rip apart their toys and go for the "squeaky" part. At the end of last year, I purchased a bag of "squeakies" to make dog toys someday. Today was someday. I made the bone as big as a piece of paper for the template using some simple circles and straight lines and erasing the center parts. I had a few extra layer cake slices of Moda Blush left so I thought it would be fun to use the blush fabric with hearts on it and create a Valentine themed dog bone. After printing the template, I cut out the dog bones (1). I sewed around the three edges leaving the center bone part open for stuffing. I snipped around the edges of the circle parts for easier turning (2). Once I turned the bone right side out, I then started stuffing both ends leaving the center part open for now (3). My dogs are so fast at opening toys to get to the squeaky, I thought I would add another layer of protection by using scrap batting to encase the squeaky (4). Then placed it in the center part of the bone and continued stuffing with the pillow stuffing. I hand stitched the opening closed. (5) The whole time I completed this step, my dogs were on either side of the table just waiting to play. I finished up and gave it the dog play test. Dog approved, see for yourself. Now, this is Mindy or as we affectionately call her "Moo", the bigger of our two yorkies and she doesn't like to share with sissy. Guess I'll need to make another one for Mandy to play with as well. I was watching Percy Jackson movie in the background so you may hear that as well.